'Tis the season to be entertaining all the time or at least that's what it feels like at our house. Contrary to what some people think throwing a party does not have to be a stressful situation. I'm a firm believer that all you need is a cocktail and some spiced holiday nuts. 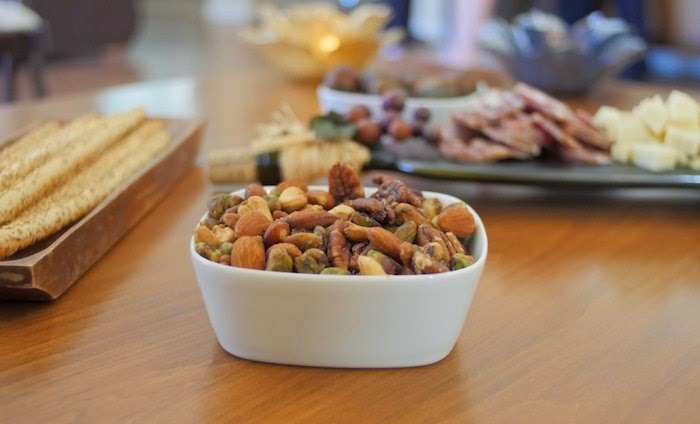 Mixed nuts are perfect for parties, they allow guests to whet their appetite without filling up. They are also easy to make, delicious to eat and fun to talk about. This holiday season I encourage you to invite a few friends over, mix up some cocktails and bring out the mixed nuts. The recipe below from Epicurious is one I enjoy and make often. In medium saucepan over moderately low heat, combine all ingredients except nuts. Cook, stirring frequently, until butter and sugar melt completely, about 2 to 3 minutes. Add nuts and toss well to combine. My daughter has a peanut/tree nut allergy, but the rest of us love nuts. We try not to keep them around the house that often, but holidays are an exception. These look worthy have keeping a secret stash! I heard for the spiced nuts first thing at any party! Looks delicious! Perfect for gift giving too. SU as well. The perfect snack! I am making these for my airplane snacks! Perfect party finger food and so simple! Oh that flavor combination sounds just perfect. What a great dish for munching! I could eat these nuts year round. They sound great! Love sweet and savory flavors along with assorted nuts! I am such a sucker for spiced nuts...I have to pull myself away so I don't keep going...and going...and going. These sound delicious! I've never considered making spiced nuts at home, it's always been something I pick up, but this is wonderful, going to try this. Love spiced nuts and these look great! My family would gobble these up! Yes, to spiced nuts - so good. Ever since I've been a kid, my family has served some sort of nuts for nibbling on before Christmas dinner. I know everyone would love this spiced version! Such a great party snack or food gift! This is a great idea for holiday snacks. I love this idea for the holidays - perfect to start off the holiday festivities! We love nuts- especially spiced nuts. I'd keep these in the house all year-round! I love the addition of rosemary and cayenne to the nut mixture! I like the touch herbs, spices and sugar on these!